SSC JE 2019: The Staff Selection Commission or SSC conducts the SSC JE exam for the recruitment of Junior Engineers. The exam is conducted once in a year. The detailed SSC JE Notification has been announced on the official website. SSC JE 2019 written exam is conducted in two phases-Tier I (Paper I) and Tier II (Paper II). Candidates can visit the official website and can start applying from 1st February 2019 and the last date to apply is 25th February 2019. SSC conducts the JE exam so as to select the best Junior Engineers in departments like the Central Water Commission, Central Public Works Department, Military Engineering Services and Department of Posts. A wide range of posts come under SSC JE. SSC JE exam is a great opportunity for engineering graduates or diploma holders who are seeking government jobs. Candidates planning to appear for the exam must be aware of all the aspects of SSC JE 2019 Notification – eligibility, application form, exam pattern, etc. 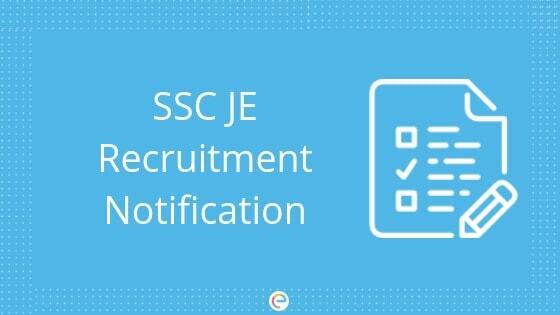 In this article, we will provide you with all the information regarding SSC JE 2019 Notification. Note: A candidate belonging to categories b, c, d and e above shall be a person in whose favor a certificate of eligibility has been issued by the Government of India. vi. Ex-Servicemen (General) – 3 years after deduction of the military service rendered from the actual age as on the closing date on receipt of online application. vii. Ex-Servicemen (OBC) – 6 years (3 years+3 years) after deduction of the military service rendered from the actual age as on the closing date on receipt of online application. viii. Ex-Servicemen (SC/ST) – 8 years (3 years+5 years) after deduction of the military service rendered from the actual age as on the closing date on receipt of online application. Junior Engineer (Civil), CPWD Diploma in Civil Engineering from a recognised University or Institute. Junior Engineer (Electrical), CPWD Diploma in Electrical or Mechanical Engineering from a recognised University or Institute. Junior Engineer (Civil), Department of Posts Three years diploma or equivalent in Civil Engineering from a recognised University or Institute. ii) Two years experience in Planning, Execution, and Maintenance of Civil Engineering works. Junior Engineer (Quantity Surveying & Contract), MES i) 3 years diploma in Civil Engineering from a recognised University. ii) Passed Intermediate examination in Building and Quantity Surveying Sub-divisional-II of the Institute of Surveyors. Junior Engineer (Civil), Central Water Commission Degree or diploma in Civil Engineering from a recognised University. Junior Engineer (Mechanical), Central Water Commission Degree or diploma in Mechanical Engineering from a recognised University. Junior Engineer (Civil), Farrakka Barrage Project Diploma in Civil Engineering from a recognised University. Junior Engineer (Mechanical), Farrakka Barrage Project Diploma in Mechanical Engineering from a recognised University. Junior Engineer (Electrical), Farrakka Barrage Project Diploma in Electrical Engineering from a recognised University. Junior Engineer (Civil), Border Roads Organisation, Ministry of Defence Three years diploma in Civil Engineering or equivalent. Junior Engineer (Electrical/Mechanical), Border Roads Organisation in Ministry of Defence Three years diploma in Electrical/Mechanical Engineering. Junior Engineer (Civil), Central Water Power Research Station Diploma in Civil Engineering from a recognised University. Junior Engineer (Electrical/Mechanical), Central Water Power Research Station Diploma in Electrical from a recognised University. Junior Engineer (Mechanical) Dte of Quality Assurance Naval Diploma in Mechanical Engineering from a recognised University. Junior Engineer (Electrical) Dte of Quality Assurance Naval Diploma in Electrical Engineering from a recognised University. Junior Engineer (Civil) National Technical Research Organisation Diploma in Civil Engineering from a recognised University. Junior Engineer (Electrical) National Technical Research Organisation Diploma in Electrical Engineering from a recognised University. Junior Engineer (Mechanical) National Technical Research Organsiation Diploma in Mechanical Engineering from a recognised University. Step 1: Visit the official website of Staff Selection Commission- ssconline.nic.in. Step 2: Click on the registration link and register yourself for the exam. Step 3: Note down the “Registration ID” and “Password”. Step 4: Enter the “Registration ID” and “Password” to log in to SSC JE application. Step 5: Fill in your “Personal”, “Educational” and “Contact” details. Step 6: Upload your recent “Photograph” and “Signature”. Step 7: Click on the “Submit” button to submit the application form. Step 8: Proceed to pay by clicking on the “Payment” option and make payment of SSC JE application fees. Step 9: Take a print out of the application form for future use. The application fees for SSC JE 2019 is Rs 100 for general category applicants. Women and applicants belonging to SC/ST, Physically Handicapped or Ex-Servicemen are exempted from paying the application fees. Application fees for SSC JE can be paid online as well as offline. Applicants can pay the fees online through SBI Net Banking or through Debit Cards / Credit Cards of any other banks. Fees can also be paid offline through SBI Challan. Note: Candidates must take a print out of the Challan generated online after completion of application part and deposit the requisite fee in designated branches of SBI. Tier I or Paper I consists of three sections, namely- General Intelligence and Reasoning, General Awareness and General Engineering. The paper carries 200 marks and has a total time duration of 2 hours. Tier II or Paper II consists of one section i.e General Engineering. The paper carries 300 marks and has a total time duration of 3 hours. SSC JE 2019 Admit Card will be released on the official website of SSC i.e ssc.nic.in. Applicants are advised to download the admit card as soon as it is out to avoid any last minute technical snag. SSC JE 2019 Hall Ticket will be available online and no offline copy for the same will be delivered to applicants via post or by any other means. Now that you know everything about SSC JE 2019 Notification, start your SSC JE Preparation right away. The exam is tough and too competitive. Getting selected in SSC JE exam is not going to be easy. Prepare in a smart manner and practice as much as you can. Take Bank Mock Test Series as it will help you in understanding the General Intelligence & Reasoning and General Awareness Section better. We hope this article on SSC JE Notification helps you. If you have any query related to SSC JE Notification, do drop down your comments below and we will get back to you. am i eligible for this exam……..
No Manoj, you are not yet eligible. Only those who have graduated are eligible, not final year students. You can apply from next year after graduation. Hey, the fees can be paid in the online mode. Hi Suman, Kindly contact the officials for this matter. We are not the official authority who can extend the date. Please contact the responsible authorities and let them know about your issue. Kindly contact the official website for the same. As it seems like some technical error.